Do you want to give back to Japan by dancing the night away? Sounds like an easy feat for most Seoulites to accomplish. TOMODACHI which is the name of the event, means friends in Japanese. The event video which can be watched on the You Tube link above has pictures of the coordinators and DJ's and the word friends translated into many different languages. Friends serves as the overall theme for the event, we can be a friend to anyone and Japan could use all of our help right now. The event representative Grant Clure said this will be an awesome event to bring the Seoul community together in support of a good cause. The two DJ'sYEONJUN and LEAM will play beats as you dance the night away. All of the proceeds including the $10 cover fee, dinner, and drink coupons will go directly to support Japan. The event is sponsored by Club Function, Macaroni Grill, Noxia, My Thai, Buddha's Belly, Luv Lounge, Berlin, Between, B1 and Real JAMusic. And all of the donations will go through NHK Central Donation Centre. NHK or Nippon Hoso Kyokai is known in English as 'Japan Broadcasting Company. 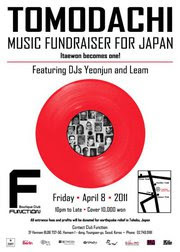 Hosted in Itaewon this Friday April 8th at Club Function, TOMODACHI begins at 10pm till whenever everyone stops partying. View the Facebook Page for more information and to invite your friends! Shake the night away for a great cause without feeling any regret.